A pair of winter traction devices for your hiking shoes or boots, microspikes provide confidence on winter hikes and icy backcountry excursions. Easy-on, easy-off, these winter traction devices are great on trails, where there is packed snow and intermittent ice. In other words, perfect for keeping you off of your tush. Super easy to use, just slip the spikes over your shoes and the built-in toe bar and flexible elastomer will keep your spikes in place, even when walking or running downhill. Use the size chart below to determine your size. A pair of winter traction devices for your hiking shoes or boots, the Chainsen Pro microspikes provide confidence on winter hikes and icy backcountry excursions. 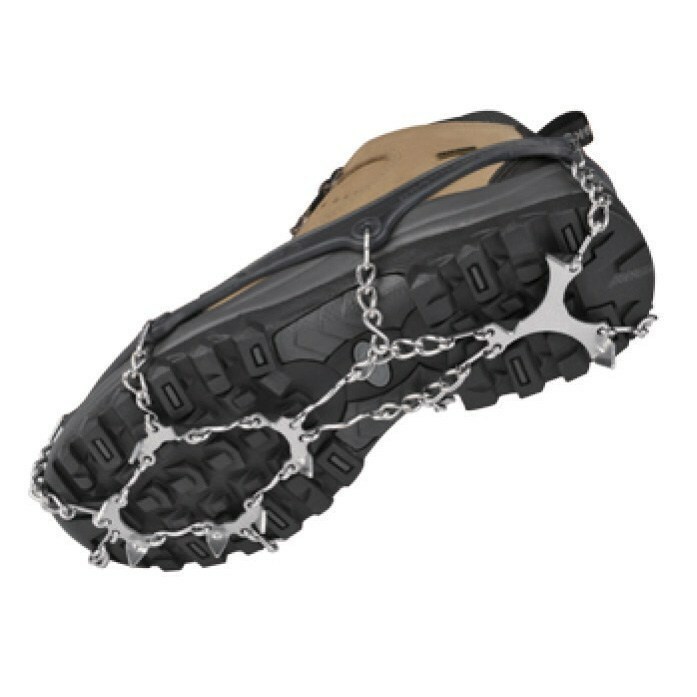 Chainsen Pro Microspikes are ideal ice crampons perfect for winter hiking and backpacking adventures. Due to their easy-on, easy-off feature, these winter traction devices are great on trails where there is packed snow and intermittent ice. Super easy to use, just slip the spikes over your shoes and the built-in toe bar and flexible elastomer keep your spikes in place, even when walking or running downhill.